When you first start out running, it's like anything else: you don't really get it. And that's fine; becoming an endorphin-crazed lunatic is a process. But as you become more and more immersed in the culture, you begin noticing yourself saying things that you had once thought were reserved only for those "special" types. You know, the guy who was running during the polar vortex, or the woman who's trying to run 50 marathons in 50 states (she's on number 28!). The "nuts" of the world trail mix, if you will. It's alarming and unsettling, but it's also a bit gratifying. You hear yourself say, "What were your splits?" and you silently pat yourself on the back because, well, you've made it. You're a runner. And just like you learn what to say as a runner, you also learn what not to say. But it's not because you read it in some running bible (aka Runner's World); it's because saying these things, as the runner that you are, frankly just doesn't make any sense. But instead of trying to make my non-running readers out there learn this the hard way, I've put together a little list for you. 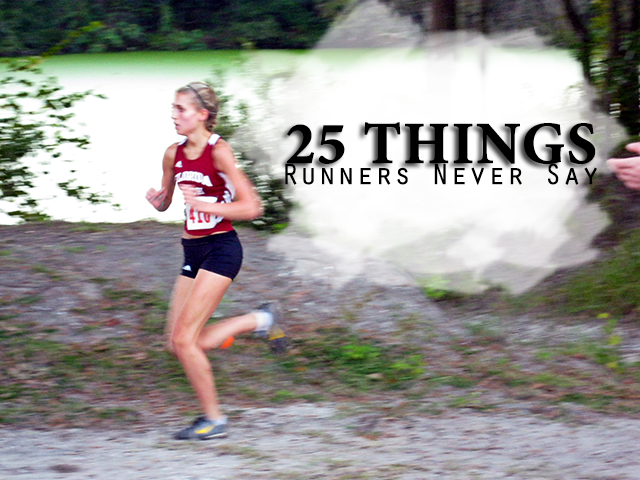 A cheat sheet, if you will, of things you will never hear a runner say. 1. I'm trying to cut out carbs. 2. Look at that sweet pair of New Balances. 3. It's too cold to run. 4. It's too hot to run. 5. Steve Prefontaine? He's the guy in the Swiffer commercials, right? 6. How long is your marathon? 7. Chafing sounds horrible. Glad that's never happened to me. 8. Garmin? You mean like for a car? 9. Pee here? But I don't have any toilet paper! 10. A port-o-pot? Gross. I'd never use one of those. 11. Want to split this bagel with me? 12. Yeah, sure, half a bagel should definitely be enough. 15. People tell me I have great hand-eye coordination. 16. Nalgene? Your Dutch cousin, right? 17. I'm really looking forward to the snow. 18. Can't wait to get on the treadmill later. 20. A new pair of running shoes? But these are only a year old! 22. A lacrosse ball? I don't play lacrosse. What in the world would I need one of those for? 23. I can't run without a shirt! 24. I can't run in underwear! 25. An IT band you say? Funny, those guys at Apple didn't look very musical. And that's your Tuesday list for you. Give a runner a hug today. It's been a long winter; they deserve it.